It is fall. Cloudy sky hangs above the gloomy town of Poliske. What once was its center is now empty. It seems that the photos are dominated by a terrible silence of a town transferred to the possession of nature. But in fact life does not stop there for a moment! Amidst the gray ghost town, we see a granny who is wearing a yellow headscarf and going somewhere. However, she walks hunched down, as if she not only pushes a wheelbarrowful of water, but also carries the burden of the Chornobyl tragedy on her shoulders. This is just one of the stories captured in the photos displayed at the exhibition of the French photographer Guillaume Herbaut “The Zone, 2009-11,” which continues in Kyiv. A SHELTER OR A NIGHTMARE? “The exclusion zone still remains a mystery to me. There, one finds oneself having a strange feeling: as if life and death have been made one in the same place. This is a place where one seems to feel oneself in a nightmare, and at the same time in a shelter,” Herbaut said. He has often visited places which have a difficult history. In addition to working as a photojournalist, he works in the genre of documentary photography as well: for example, he worked in Auschwitz and Nagasaki. In addition, Herbaut has covered fighting in eastern Ukraine... He received the Bayeux-Calvados Award for war correspondents in the category of web journalism for his Ukraine travel diary, which was created for Arte Info. 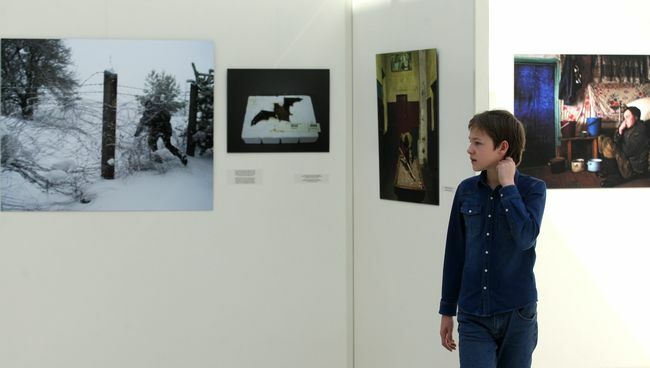 However, Chornobyl, as the photographer says, “has stayed with me.” Herbaut repeatedly returned there, and the current photo exhibition “The Zone, 2009-11,” which takes place as part of the French Spring festival in Ukraine, can be seen as a kind of a summary of these trips. “‘The Zone, 2009-11’ is an exhibition of works by a European artist that reveals a completely new, unexpected perspective on the Ukrainian territory. It so happened that now we have a lot of zones, but this one was the first. However, life is still going on there. And it is the ability to see it that is now being displayed on the premises of our museum,” director of the Taras Shevchenko National Museum Dmytro Stus told us. Triumph of life can be seen in various aspects – in particular, in the fact that nature is gradually removing from that space the traces of a manmade disaster. The cobblestone streets and stairs are overgrowing with moss, and what once was, as we know, an industrial center which harmed nature, now has to obey its will. At the same time, people’s lives are renewed, as the exhibition includes photos of the entrance to a dance club in the village of Radynka and a wedding in the town of Krasiatychi. This is especially noticeable in stories of people who are living in the exclusion zone these days. Some people have never left their homes. In particular, one can see at the exhibition a photo of the inhabitants of the town of Poliske, which once had 20,000 residents. Now there are no more than 10 of them. However, there are also those who have deliberately chosen life in a dangerous zone. For example, one of the photos portrays Natalia, who has moved with her family from Kyiv to the town of Bazar, which is located in the closed zone of Chornobyl. The town’s mayor encourages such initiatives by offering abandoned homes for free. And the young family, which is trying to escape the economic crisis, decided that it was a good idea. So, these stories are not only about Chornobyl, in fact, but also about the fates of contemporary Ukrainians as seen through the prism of this topic. A photo showing a man crossing the border into the closed zone is particularly telling. He goes to a military vehicle graveyard near the village of Rozsokha. It was there that thousands of radiation-contaminated vehicles were taken: fire trucks, armored personnel carriers, and a few helicopters. The man makes such trips from time to time to collect scrap metal and deliver it to a nearby scrap metal dealership. This is exactly how things were in the years when Herbaut visited Chornobyl. This photo is a kind of symbolic. What motivates Ukrainians to do such things? Is it poverty, hopelessness, the desire to survive or indifference and irresponsibility regarding the fate of others, a profit motive? Whatever the answer, the photo exhibition has achieved its main goal, as Ukrainians have something to ponder about now. The exhibition “The Zone, 2009-11” is a good occasion to remember international cooperation on the elimination of the consequences of the Chornobyl tragedy. Durufle hopes that the sarcophagus (which was built with the support of France) will improve the situation in the exclusion zone and make this area safer.